Tervetuloa tunnettu Angel Plaza luksusasuntoja vain kivenheiton päässä Vanhankaupungin keskiaikainen Market Square, suurin Euroopassa ja keskeinen Krakovan charmia. Meidän huoneisto on myös lähellä Planty Park Area, Wawelin linna, Wisla-joen, ja Kazimierzistä. Huoneisto on täysin uusittu. Asunto on mukava sekoitus modernit mukavuudet ja erinomainen sijainti mukavuuksia, kuten pysäköinti, ilmastointi, hissi, parveke, 24 tunnin concierge, kuntosali, kylpylä, kuiva ja märkä saunoja. Lisäksi meillä on automaattinen pesukone / kuivuri combo mikä on melko harvinaista Euroopassa. Queen Beds (160 cm x 200 cm) makuuhuoneessa ja vuodesohva, mukavasti mahtuu neljä vierasta. Yhden makuuhuoneen, yksi kylpy huoneisto on hyvin varustettu. Mukana ovat täysin varusteltu keittiö, WiFi, ja kaapeli-tv olohuoneessa ja makuuhuoneessa. Zwierzyniecka Street on monia kauppoja, ravintoloita, Jubilat ruokakauppa ja tavaratalo, lähellä vielä enemmän ravintoloita ja kahviloita Vanhassakaupungissa yhdessä historiallisia monumentteja, kirkkoja, kasinot ja museoita. Meidän Angel Plaza Gem on täydellistä tutustua mitä Krakova tarjoaa sekä paikallisesti kuin kotiin tukikohta Wieliczkan suolakaivokselle, Auschwitziin, Zakopane, Tatravuorten, Kryspinow Lake Wadowice (koti Johannes Paavali II), ja muut kohteet Etelä-Puolassa. Odotamme tarjota sinulle erikoisia asunto Angel Plaza kun imevät ja ihailla elämän ja sielun Krakovan! Kylpyhuone suihkulla ja pesukone / kuivausrumpu combo. Excellent. This property is well worth the money. We are a couple in our late 60's. 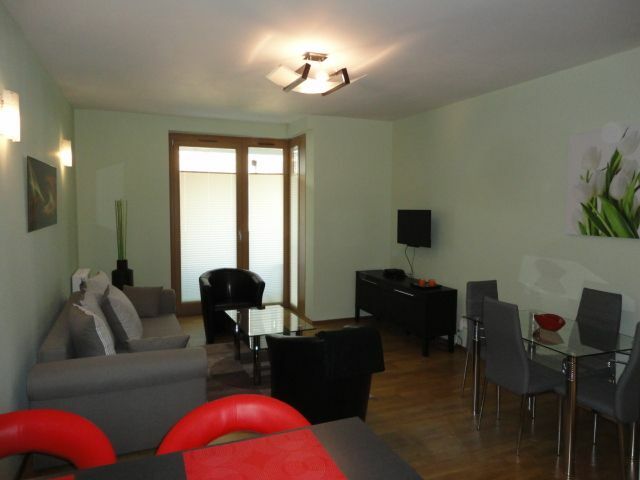 This apartment is centrally located very close to Wawel Castle. The apartment is modern and bright and located on Floor 1 (second floor for us Americans). The area appears very safe and the apartment is in a secure building. The Concierges are helpful, but they do not speak much English. The gal who checked us in was on time and could not have been kinder. Best buy in Krakow! Super accommodations. Highly recommend this apartment in a secure building close to the center of Krakow. Comfortable bed. Great water pressure in the shower. Plenty of towels and some small toiletry items. Layout works quite well for a couple. We had a great time. The owner was quite responsive. Thanks Ken!! Can also recommend the Gossip Cafe for a real breakfast - just a short walk towards the City. For dinner, the Restaurant Cafe Orangerie (at the Hotel Kossak, two blocks in the other direction) offers spectacular views of the city - and delicious food. Really glad we engaged a private tour guide - Marta Chmielowska and her husband for some tours. It made all the difference. I recommend this apartment in Krakow for the following reasons: all the rooms were furnished nicely with plenty of closet and cupboard space in the bedroom, a nice shower in the large bathroom and nice sitting area with a balcony; the owner and agent promptly answered our questions and made our stay very enjoyable; the staff manning the desk by the entry were very friendly and helpful regarding question about restaurants; and, most importantly, the location was great for walking to the major Krakow tourist sites. We will definitely want to stay here again on our next trip to Krakow! In more than 20 years of renting houses and apartments in Europe, we think this one was one of the best ever. Perfect in every way, with excellent kitchen equipment, comfortable sitting room, good bed, good bathroom, clear washing machine instructions, air conditioning, very good security, very clean - we cannot find anything to criticise about the place at all. With all of that, it is easy to get to the centre of Krakow but it was quiet and well set back from the street and traffic noises. We cannot recommend this apartment highly enough. Fine 4 nights in Angel Plaza Apt. Very comfortable apartment with modern furnishings and many conveniences. Angel Plaza sijaitsee 5 minuutin päässä vanhasta kaupungista, Wisla-joen ja Wawelin linnasta huoneisto on lähellä Kazimierzistä ja kulttuuri-ja historiallisia kohteita. Se on sekoitus moderneja mukavuuksia lähellä kaikkia merkittäviä monumentteja ja locales.